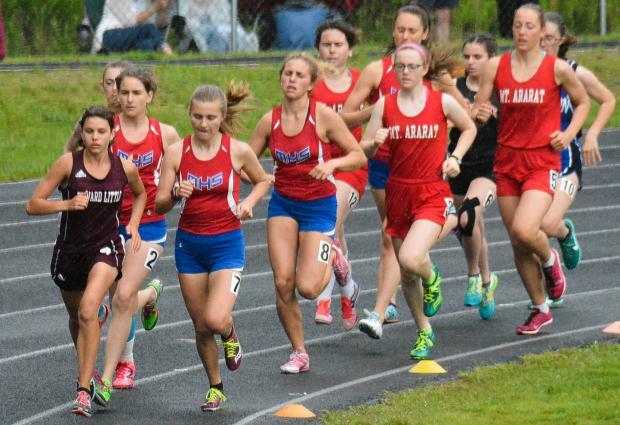 The Edward Little women's team repeated as KVAC Class A Champion amassing 178 points to best runners-up Messalonskee for the second straight year. It was a little easier for the Red Eddies this year as they had a margin of 52.5 points. In 2017 the Eddies ended with a half point margin and needed their fifth place finish in the 4 x 400 to secure the title. There were more points available for the larger squads this season as the KVAC has been diminished by two teams with the move of Cony and Mt. Blue to Class B. As a result the seven scoring places were to be divided among the seven teams rather than nine squads. The ability to pack on points that comes with depth gave the Eddies a leg-up. Where the Class B meets was characterized by a waterfall start for the 4 x 8 relays, the Class A meets were characterized by empty lanes and, in a few cases, last place finishers being awarded points. How did EL do it? Their scoring leader was first year Lindy Hyndman with firsts in the 100 (12.96), and the 200 (29.94). Hyndman also had a top podium spot in the 4 x 100 where she was joined by Julia Berube, Kiara Fournier, and Hanna Roy. Hyndman, a first year, also found the time to place fourth in the triple jump and established a pair of new personal bests. Ella Boucher won two events for the Eddies jumping 16-0.5 to take the long jump with a new personal best, and took the top spot in the 300 Meter hurdles at 48.90. Boucher tagged on a second place finish in the 200 and on a third place finish in the 100 to score in four individual events. Boucher is also a freshman and set new personal marks in two events on the day. Close on Hyndman and Boucher's heels was stalwart Jillian Richardson. The junior crushed the field in the 1600, running 5.24.84, and ran a comfortable first place for the eight laps of the 3200 to finish in 11:53.03. Richardson also gritted out a fifth place finish to the 800 to help out. Richardson tore more than ten-seconds off her season's best time and took nearly six-seconds of here prior personal best set in the 2017 State Meet. Other individual champions for the Eddies were Grace Fontaine in the 100 meter hurdles, and Lauren Berube cleared 10-6 to win the pole vault. 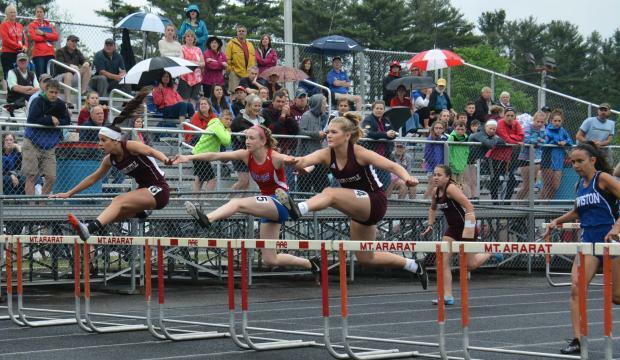 Fontaine added a third place in the 300 meter hurdles, while Lauren Berube also claimed the last point in the javelin throw. But the real strength for the Eddies was their depth at the hurdles and in the sand. In addition to Fontaine's' winning time of 16.97 in the 100MH, the Eddies placed at three, five, and seven. Fontaine cracked 17 seconds for the first time. Julia Berube, Kiana Fournier, Benedicte Kalonda, and Olivia Jalbert placed in multiple events for the Eddies. A first year also lead the scoring for the runners-up from Messalonskee. Charlotte Wentworth took the title in the 400 (1:01.69), and shared the top spot on the 4 x 400 podium with teammates Alexa Brennan, Emma Wentworth, and Emma Concaugh. 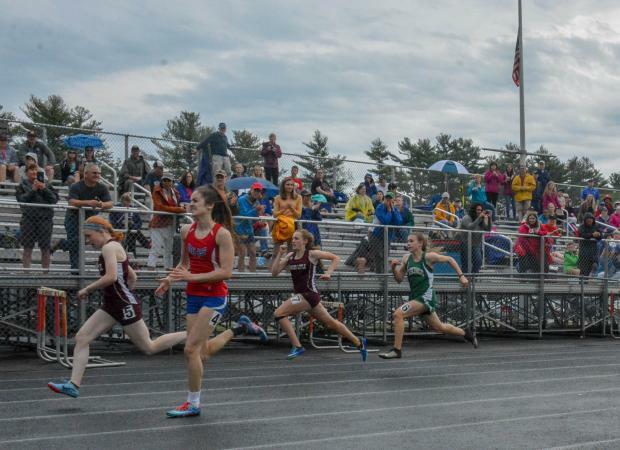 Charlotte Wentworth also placed second in the 800 conceding the top spot to Brunswick's Maddie Wayne who finished at 2:27.40. 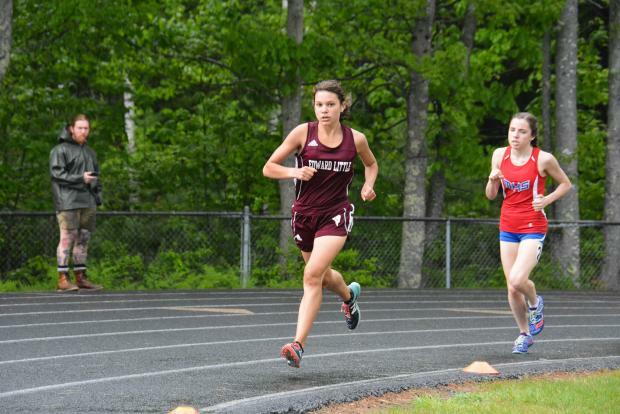 Messalonskee got strong performances in the distance events with Sarah Kohl taking second in the 3200 and third in the 1600 while Peyton Arbour took fifth in both. 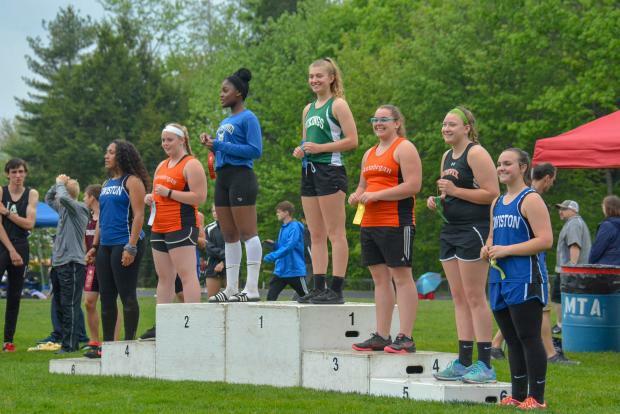 Others placing in multiple events for Messalonskee were Emma Wentworth, Jacey Richards, Emma Concaugh, Alexa Brennan, Markiana Hewett, and Libby Breznyak. 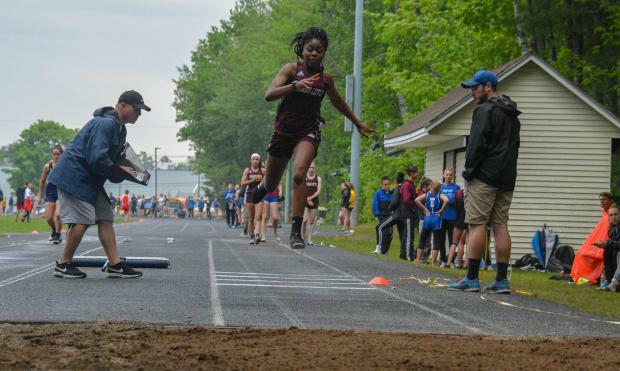 Leah Savage, a triple threat in jumps fouled at the long jump so did not place but secured the top spots for Skowhegan in both the high jump 5-0, and the triple jump 33-00.5. As always the women from Oxford Hills showed their prowess at throwing. Maighread Laliberte claimed the Don Matheson Award as the meet's best field performer with wins in the discus (98-03) and shot put (34-08.50), and teammate Jadah Adams took the top spot in the javelin with a throw of 122-01, a new personal best. And as always Lailberte's first name confounded the public address announcer. Competent authorities suggest May-red will do in a pinch. Lewiston's Marissa Larock took the race-walk in a time of 9:36.68. The host Mt. Ararat Eagles started the day well taking the first spot in the women's 4 x 800 as Karli Leighton, Anna Harbo, Josie Miller, and Camila Ciembroniewicz completed the 3200 meters in 10:17.36, but the Eagles took no other titles. 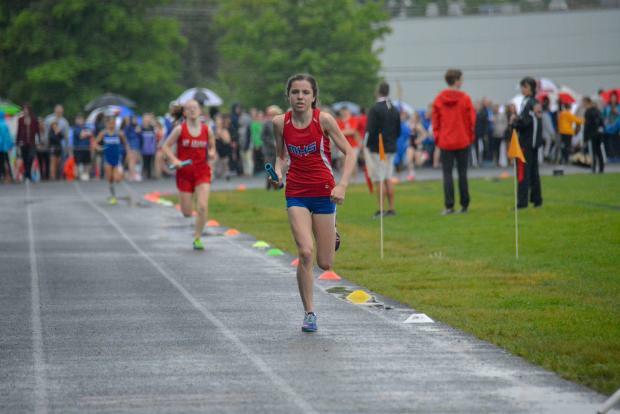 Absent from the meet were senior Katherine Leckbee who always challenges for the top spot in the 1600 and 3200, can lend a hand in the 800 and improves any 4 x 800 or 4 x 400 team. Also unavailable was sophomore Wyley Fitzpatrick who would have been favored in the sand and challenged in the 200 and 400.